POSTED February 27, 2019 11:23 a.m.
Fennimore’s Reid Larson stands alone. 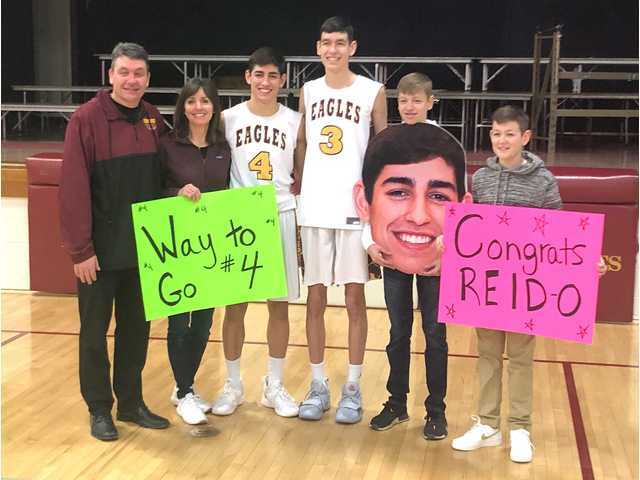 With a sizzling, game-high 26-point performance in Fennimore’s 90–41 SWAL victory over Riverdale on Saturday, Feb. 9 the talented senior shooting guard etched his name atop the Golden Eagles’ all-time scoring list, passing uncle Kevin Larson. The elder Larson, who graduated in 1987, finished his career with 1,547 points on 640 made baskets and 267 made field goals, in the days before the 3-point line. Reid Larson, who is a 3-time first-team All-SWAL performer went on to score 19 points in a 62–48 loss to Cuba City nine more in a 68–51 Senior Night victory over Boscobel and closed out the regular season with a stellar 28-point outburst in Fennimore’s 68–50 win at Southwestern last Thursday night. He now has 1,605 career points entering Friday’s WIAA Division 4 regional semifinal playoff game against fifth-seeded Wisconsin Heights (16–6), which beat 12th-seeded Brookwood (6–16) in Tuesday’s opening round. Reid Larson and younger brother Adam Larson combined to score 52 points on just 27 shots in last Thursday’s dominating win over fifth-place Southwestern (11–10, 6–8 SWAL). The Golden Eagles (18–4, 10–4), who finished tied with Cuba City for third in the SWAL, got off to a slow start, but quickly recovered from a 5–0 deficit. Reid Larson made 12 of 17 shots, including 3 of 5 from beyond the 3-point arc en rout to his game-high 28 points. He also grabbed 10 rebounds, had four steals and three assists. Adam Larson missed just one shot on the night, finishing 9 of 10 from the field, 3 of 3 from distance and 3 of 3 from the free throw line to finish with 24 points. Junior point guard Kellen Kenney scored all eight of his points early on as Fennimore built outscored the host Wildcats 35–20 over the final 16 minutes of the first half. He also passed out a team-high nine assists and grabbed three rebounds. “Southwestern is a tough place to play,” added Larson. “It was a really good note to end the regular season on. It was definitely a game I didn’t think we could take control of the game and walk away from them. I think we needed this as a team to get rolling going into the playoffs. The team camaraderie was great after the game. NEXT: The Golden Eagles earned the #4 seed in their half sectional and had a first-round bye when regional play begins Tuesday. Fennimore will host Wisconsin Heights Friday night at 7 p.m.
“Wow, our regional is unbelievable,” said Larson. “We are part of a regional that you would rather not be in. I really believe the one through eight seeds can all win this half sectional. We are in the mix to play Wisconsin Heights, which just knocked off Darlington a week ago and they are a five seed. That just shows how tough this bracket is. Fennimore (18–4, 10–4) — Adam Larson 24, Reid Larson 28, Logan O’Brien 2, Kellen enney 8, Jacob Young 2, Warren Adam 4. Totals – 29-47 4-4 68. Southwestern (11–11, 6–8) —Breckin Schneider 11, Cayden Splinter 3, Tytan Kephart 3, Justin Wilson 2, Grant Jochum 11, Shaun Cooper 7, Dylan Rieken 11, Vaughan Lacey 2. Totals – 20 4-8 50. 3-point goals — F: 6 (A. Larson 3, R. Larson 3), S: 6 (Jochum 3, Rieken 2, Kephart 1). Total fouls – F: 9, S: 8. Fouled out – none.